The NoVES Book Club will meet on September 23rd at a members home in Alexandria, VA. If you are interested in participating please email eugeniaburkes@mac.com. 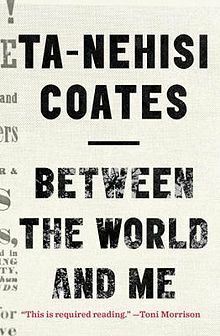 We will be discussing the NY Times best seller, Between the World and Me by Ta-Nehisi Coates, a national correspondent for The Atlantic and a finalist for the National Book Award and a MacArthur “Genius Grant” fellow. This book is a series of letters to his teenaged son that walks us through the course of his life, from the tough neighborhoods of Baltimore in his youth, to Howard University—which Coates dubs “The Mecca” for its revelatory community of black students and teachers—to the broader Meccas of New York and Paris. Coates describes his observations and the evolution of his thinking on race, from Malcolm X to his conclusion that race itself is a fabrication, elemental to the concept of American (white) exceptionalism. Coates is direct and uncommonly insightful and original.